<big><big> <big><big> <big><big>VOTE HERE:</big></big></big></big></big></big> <br/> <a href="http://www.mortalkombatonline.com/content/forum/showmessage.cds?id=160730">http://www.mortalkombatonline.com/content/forum/showmessage.cds?id=160730</a> <br/><br/><br/><br/><br/><br/><br/><br/><br/><br/><br/><br/><br/><br/><br/><br/><br/><br/><br/><br/><br/><br/><br/><br/><br/><br/><br/><br/><br/><br/><br/><br/><br/><br/><br/><br/><br/><br/><br/><br/><br/><br/><br/><br/><br/><br/><br/><br/><br/><br/><br/><br/><br/><br/><br/><br/><br/><br/><br/><br/><br/><br/><br/><br/><br/><br/><br/><br/><br/><br/><br/><br/><br/><br/><br/><br/><br/><br/><br/><br/><br/><br/><br/><br/><br/><br/><br/><br/><br/><br/><br/><br/> Post here if you're interested!!! <br/><br/> CONFIRMED KONTESTANTS: <br/> <br/><i><small>(the usual suspects):</small></i> <br/>VenoMark <br/>BlackSaibot <br/>saiZero <br/>illusion <br/>fedegita <br/>UltimateRyu <br/> <br/> <i>Proposed rules</i> <br/> <br/><b>1.</b> Each character must be of MK origin or an original character. Characters from other game/movie/tv series will not be accepted. <br/> <br/><b>2.</b> The arena must be of MK origin or an original creation. Arenas from other game/movie/tv series will not be accepted. <br/> <br/><b>3.</b> Characters are NOT required to be performing a fatality or special move. <br/> <br/><b>4.</b> Animations are acceptable. <br/> <br/><b>5.</b> All sprite work must be from the original MK games <big><b><i>or</i></b></big> created by yourself from scratch. No collaboration with other artists (except asking for critiques) is permitted. No borrowing or manipulating from other sources (other artists, MUGEN, image search engines, etc.). This includes resizing renders, textures, and/or screenshots from 3D-era games. <br/> <br/><b>6.</b> Entries are to be submitted by December 31, 2017. You can submit before then, and re-submissions will be accepted until the due date. I will only accept your LAST submission, so make sure you send the latest one. <br/> <br/><b>7.</b> Do not watermark your images; the kontest is to be ANONYMOUS to avoid favoritism during the voting process. Do not post your work ANYWHERE ELSE or you will FORFEITED. <br/> <br/> <br/>The official categories are the: <br/>1) Best Overall Fake <br/>2) Best Character Sprites <br/>3) Best Original Arena <br/>4) Most Creative Idea <br/> <br/>The person who wins the most votes for best overall category, is the grand champion (aka the winner of the kontest). <br/> <br/>First place in the other categories counts as second place winners. <br/> <br/>Second place in the other categories count as third place winners. <br/> <br/>Everyone else is a .... well........... loser. Post here if you're interested!!! 1. Each character must be of MK origin or an original character. Characters from other game/movie/tv series will not be accepted. 2. The arena must be of MK origin or an original creation. Arenas from other game/movie/tv series will not be accepted. 3. Characters are NOT required to be performing a fatality or special move. 5. All sprite work must be from the original MK games or created by yourself from scratch. No collaboration with other artists (except asking for critiques) is permitted. No borrowing or manipulating from other sources (other artists, MUGEN, image search engines, etc.). This includes resizing renders, textures, and/or screenshots from 3D-era games. 6. Entries are to be submitted by December 31, 2017. You can submit before then, and re-submissions will be accepted until the due date. I will only accept your LAST submission, so make sure you send the latest one. 7. Do not watermark your images; the kontest is to be ANONYMOUS to avoid favoritism during the voting process. Do not post your work ANYWHERE ELSE or you will FORFEITED. The person who wins the most votes for best overall category, is the grand champion (aka the winner of the kontest). First place in the other categories counts as second place winners. Second place in the other categories count as third place winners. Everyone else is a .... well........... loser. Sure I'm in. It's always more fun when some of the heavy hitters are playing ball. Ya'll better be ready to dance. Looks like I'm out, but as always, I look forward to all the awesome entries. Ah, I misread the rules or was distracted at the time. I thought it said you basically had to freehand create original stuff. It should come to no surprise that I have to make the announcement that VenoMark has backed out of this kontest. <br/> <br/>saiZero says she is finished but will not submit until the deadline, which is fair and smart on her part. <br/> <br/>I am 90% finished. <br/> <br/>I hope everyone else is on track... <br/> <br/>Thanks again for those who joined and are sticking through to the end. The MUGEN community at least will appreciate and enjoy the hard work and dedication of your sprite edits. It should come to no surprise that I have to make the announcement that VenoMark has backed out of this kontest. saiZero says she is finished but will not submit until the deadline, which is fair and smart on her part. Thanks again for those who joined and are sticking through to the end. The MUGEN community at least will appreciate and enjoy the hard work and dedication of your sprite edits. I'm still in the game - almost finished the sprites soon hopefully, then on to the background. <div class="forumQuote"><b>fedegita Wrote:</b><br/><div class="forumQuote"><b>blacksaibot Wrote:</b><br/>Thanks again for those who joined and are sticking through to the end. The MUGEN community at least will appreciate and enjoy the hard work and dedication of your sprite edits.</div> <br/><br/> <br/><br/>I'm still in the game - almost finished the sprites soon hopefully, then on to the background. <br/><br/> <br/><br/>(Damn I feel rusty! )</div> <br/> <br/>Good to hear; always looking forward to one of your backgrounds (that is not to say your sprites aren't good). Good to hear; always looking forward to one of your backgrounds (that is not to say your sprites aren't good). How is everyone doing? Will hopefully have mine submitted soon, not that we have much time left anyways. 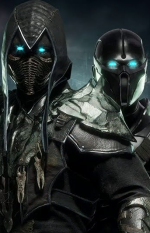 Please note the "bs" in front of blacksaibot. Are we allowed to submit pics or animations larger than the standard 400x254 dimensions as long as it fits in the post box on MKO? Obviously blacksaibot is the one to answer this but... I'd assume it's okay, and even if it is bigger than the MKO post box, we can always right-click and view image to see the whole thing. <div class="forumQuote"><b>UltimateRyu Wrote:</b><br/>Are we allowed to submit pics or animations larger than the standard 400x254 dimensions as long as it fits in the post box on MKO?</div> <br/> <br/>Yes.